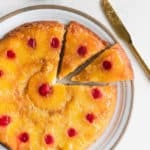 Pineapple Upside Down Cake Recipe – This is the best pineapple cake recipe online! It’s a moist sponge cake caramelized to perfection with brown sugar pineapple rings and cherries. 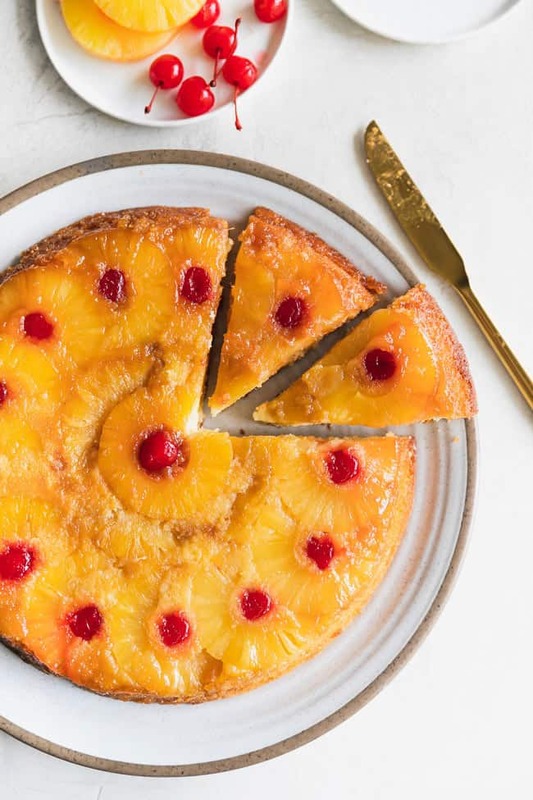 There aren’t many things more traditional and lovely than a pineapple upside down cake. My recipe is an old one, but a wonderful one. This moist sponge cake topped by brown sugar sweetened pineapple rings and cherries is perfection. What is a pineapple upside down cake? Pineapple upside-down cake is a single layer yellow butter cake upturned after baking to reveal a gleaming mosaic of caramelized pineapple rings. It was invented because several other convenience items were invented that gave the housewife time to make a cake pretty as well as delicious. The method of cooking a cake upside down, is a technique that was developed centuries ago when cakes were cooked in cast iron skillets. It was easy for a home baker to add fruit and sugar in the bottom of the pan, add a simple cake batter on top and put it over the fire to cook. Once done it was flipped over onto a plate, a natural way to show off the beautiful fruit and let its flavor run into the cake as well. The idea to use pineapple came in 1911, when one of James Dole’s engineers invented a machine that would cut his pineapple into rings. The convenient and visually appealing rings were soon used in this age old technique of the skillet cake. The maraschino cherry addition was simply used to create the necessary color contrast needed to take this cake above and beyond. Why make a pineapple upside down cake from scratch? The pineapple upside down cake is possibly the perfect cake. 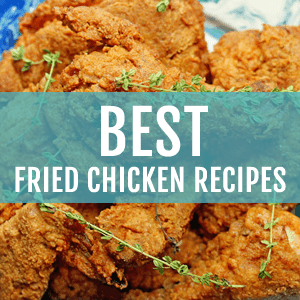 Its ingredients are inexpensive, and are even often found in the everyday pantry. Preparation and baking times are always under an hour. 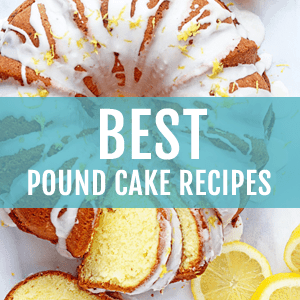 You could make dessert for a last minute dinner party, make an unconventional birthday cake or fulfill a late night craving while barely lifting a finger. It’s classic look and well-balanced flavors speak to everyone. A true crowd pleaser. Now, you may not consider yourself to be classic. You find yourself out of the ordinary and you need your desserts to reflect that. 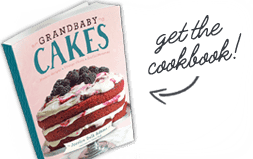 So add your flare, introduce a new element and make this cake your own. Whether you add caramel, peaches or make them mini in size there are endless ways you can take this recipe and truly make it your own. So don’t be afraid to. Using the right equipment is vital, it ensures that your cake cooks evenly and your flavors are consistently delicious. Personally, I love using my cast-iron because the flavors are truly unbeatable. It’s crucial that your cast-iron is properly seasoned so that your cake does not stick to the bottom. The heavy steel pan also keeps the butter from burning and the handle makes it easy to flip the cake upside down when it is done. So if you’ve got your grandmother’s or mother’s old skillet it’s time to dust it off, season it and get to work. Have you ever wanted to know how to make pineapple upside down cake? Well this recipe is here to teach you. I found it in one of my Big Mama’s old handwritten recipe notebooks so I knew it would be amazing, and indeed it was. Whenever you see a cake made in a cast iron skillet, you know it has the goods. I have tried making pineapple upside down cake in some very inventive ways but sometimes a classic recipe is really all you need. This cake starts with a light, yet moist sponge cake base with a hint of pineapple juice to really liven up the flavor. 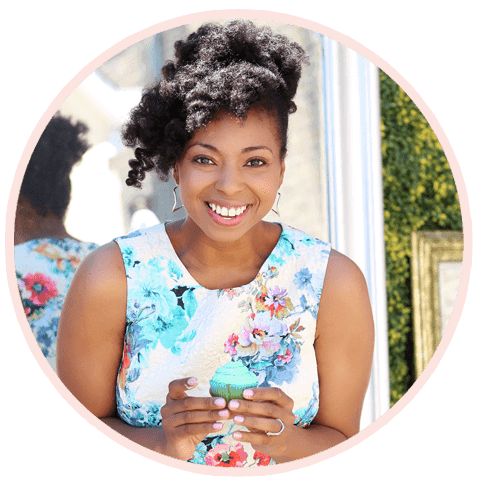 The juice also introduces added moisture that creates the melt in your mouth feeling you didn’t even know you needed. Adding that touch of pineapple makes for a balanced pineapple essence in every single bite you take. The base is really a pineapple cake recipe on a smaller scale. 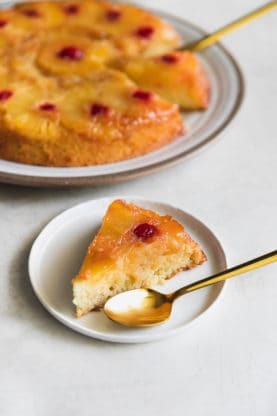 The best part of any pineapple upside down cake is its bottom (or top once its turned over). I love using a cast iron skillet to really get that deep caramelization from butter and brown sugar. Add your pineapple rings and cherries (I actually leave these out due to a cherry allergy) and you have the most perfect cake. You can use fresh pineapple for this but make sure to cut the pineapple slices thin enough so that they get tender during the bake. For ease, you can just used canned pineapples. They are also perfectly sized and evenly sized, and you can use the juice in the can for the juice in the recipe. Once you flip the cake over (this cake comes out perfect each and every time), the buttered brown sugar sinks deep into the sponginess of the cake creating the most sensational taste ever. Each bite is filled with a rich, caramelized flavor that perfectly contrasts with the sweetness of the pineapple rings. The pineapple slices themselves are tender, fruity and wonderfully fragrant. Every slice is truly what makes this cake what it is: slightly tropical and excitingly nostalgic. While the cherries are primarily for aesthetics, they also offer a little pop of sweetness unlike any of part of the cake. I love to eat it when its fresh out of the oven and cooled just for a few minutes. When warm, this cake is truly perfection. You could even add a scoop of ice cream too! In fact, I insist on it. Check out the recipe below! And if you want more Pineapple Upside Down Cake inspiration check out these Pineapple Upside Down Pancakes. Or these individual Pineapple Upside Down Hummingbird Cakes! Or even for summer grilling, I love to make these Pineapple Upside Down Milkshakes and these Grilled Pineapple Donut Sundaes. And if you want to go savory, try my Pineapple Honey Bourbon Grilled Catfish. It is serious eats. This No Bake Pineapple Dream Dessert from Crazy For Crust is calling my name. I’m ready to get my grill hot to make this Grilled Pineapple with Cinnamon Honey Drizzle from Wine and Glue. Make sure you make me a tall glass of this fun Pineapple Mojito from Barefeet In The Kitchen. 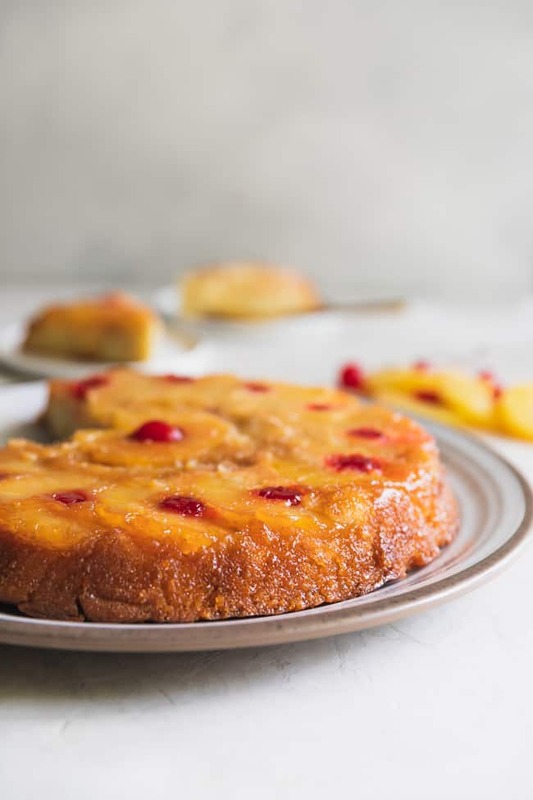 Pineapple Upside Down Cake Recipe - This is the best pineapple cake recipe online! It's a moist sponge cake caramelized to perfection with brown sugar pineapple rings and cherries. For the cake batter: In a large bowl, whisk together flour, sugar, salt, baking powder, vanilla extract, eggs and pineapple juice until well mixed. Set aside. Next melt butter to a 9 inch cast iron skillet over medium heat. Once melted, whisk in brown sugar and cook for 1 minute. Line the bottom of the butter and sugar mixture with 6 to 7 pineapple rings and cook over medium heat for an additional 2 minutes. Pour cake batter on top of the pineapples. Bake cake for 28-33 minutes or until toothpick inserted into center comes out clean. Cool cake for 10 minutes then invert the cake onto a serving plate and serve. This is the best cake ever! We have to double the recipe, or else it is gone too fast! Such a gorgeous cake!! I can’t wait to try it!! Such a cheerful and vibrant dessert! I can’t wait to try a slice! This is really gorgeous! Looks perfect!! Nothing beats a good classic dessert! Wish I had a slice right now! Yes ma’am! You are correct, This is the Best Pineapple upside down cake recipe on the internet! I tried to attach a picture but i don’t see how to do it? This cake is RIDICULOUS!!!! I’ve made it several times, always DELISH!!!!! The brown sugar and butter that’s all squishy, omg!!! I’m must make it again today!!!!! This is my husband’s favorite cake. I make it in my old electric frying pan, as that is how my mom made it. I’m 65, so you know how long ago my mom made it! Just bought your book can’t wait to take it for a twirl! This is one of my husband’s fave dessert. I made it a lot when we were dating. Oh girl that’s how you snagged it! It is so amazing Tina! I keep wanting to make pineapple upside down cake as a tribute to my granny who was known for hers. I need to try this. It looks awesome and sounds easy to make! Its super easy to make and I surely love a tribute to granny!!! They are seriously the best ever!! Sometimes you just can’t be a classic like this! Looks perfect! I’m loving the brown sugar. It makes it so much more caramelly and wonderful! Yes the brown sugar is soo necessary!!! You almost can’t have it without the brown sugar! 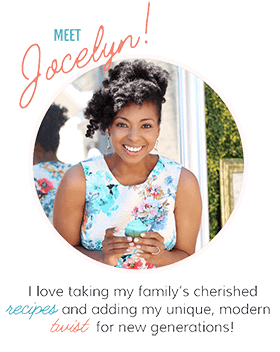 This was one of my favourite desserts when I was a child, Jocelyn. It’s so delicious with creamy English custard. I’m sure any dinner guest would still be wowed by this enduring classic. Love your mini versions, too! They’re stunning! Thanks so much Helen!!! I need to try it with English custard! This is a cake I have yet to tackle. So naturally beautiful. I love the rings of pineapple! It is seriously such a simple cake to make too! Same here!!! I basically had to figure out the entire thing lol. I think I got it right lol. Thanks so much Alyssa!!! I do too! Thanks so much Kathi!!! It is amazing indeed my dear! Same here! I am a big upside down cake fan! Love Upside Down Cakes.. this one looks soo good. I am sure it was as goos as it looks. Thanks so much Ella! I do too! 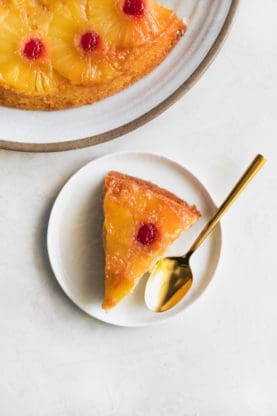 I just love how pineapple upside down cakes look. Great recipe. Thanks so much Erin!! I love how they look too! Thanks so much Marcie! You are a woman after my own heart. I adore them too! You know what Jocelyn, old recipes are usually the best 😉 I totally respect an old recipe. Pineapple upside down cake forever brings me back to making it with my grandmother one summer. I was completely clueless to what it was, until we made it together, and I loved it! I’ve never made it though :/ sad huh? Pinned this for later. Thanks girl! Thanks so much Kelly! There is something so nostalgic about this cake!! Especially when you make it with your grandmother.